Designation: Department of Internal Medicine, Reading Hospital and Medical Center, Pennsylvania. Copyright: © 2019 Singla M. This is an open-access article distributed under the terms of the Creative Commons Attribution License, which permits unrestricted use, distribution, and reproduction in any medium, provided the original author and source are credited. Leg cramps is a very common complaint in primary care office. More than 50% of the patients are found to have diabetes who presented with leg cramps and up to 80%  of pancreatic cancer patients present with either new-onset type 2 diabetes or impaired glucose tolerance at the time of diagnosis. Leg cramps should be worked up to look for new onset diabetes that could essentially lead to and unmask underlying pancreatic cancer. The data linking high glucose levels with an elevated risk of pancreatic cancer have led some to suggest that the new onset of diabetes in a thin older adult should prompt consideration of screening for early diagnosis of a potentially resectable pancreatic cancer. But so far no clear-cut guidelines over there that suggest which parameters should be taken to consideration for CT screening for pancreatic cancer in a newly diagnosed diabetic patient. Leg cramps; Diabetes mellitus; Pancreatic cancer. ALeg cramps is a very common complaint in primary care office. More than 50% of the patients are found to have diabetes who presented with leg cramps and up to 80%  of pancreatic cancer patients present with either new-onset type 2 diabetes or impaired glucose tolerance at the time of diagnosis. Leg cramps should be worked up to look for new onset diabetes that could essentially lead to and unmask underlying pancreatic cancer. The data linking high glucose levels with an elevated risk of pancreatic cancer have led some to suggest that the new onset of diabetes in a thin older adult should prompt consideration of screening for early diagnosis of a potentially resectable pancreatic cancer. But so far no clear-cut guidelines over there that suggest which parameters should be taken to consideration for CT screening for pancreatic cancer in a newly diagnosed diabetic patient. Muscle cramping is a very common presentation for diabetes. It could be due to low potassium or peripheral vascular disease-causing peripheral neuropathy. The cramps tend to be more common in the lower extremities and may be seen more commonly at night. Sometimes patient is a diagnosed with restless syndrome. But unfortunately, patient could have underlying pancreatic cancer that could be the cause of diabetes as up to 80% of pancreatic cancer patients present with either new-onset type 2 diabetes or impaired glucose tolerance at the time of diagnosis . This case demonstrates patient is presenting with severe leg cramps looks like restless leg syndrome could have underlying diabetes from pancreatic cancer. 61 years old male with past medical history of hypertension and anxiety on amlodipine and Diovan and clonazepam presented to the office with severe Leg cramps. Not able to sleep at night leg cramps are more worse at night. Denies any polyuria polydipsia or any dry mouth. Legs were hurting at nighttime when he is trying to come downstairs goes up stairs and subsequently gets severe leg cramps at night when he is sleeping. Denies any weight loss any nausea and vomiting no other complaints. Initially was given muscle relaxants for couple of days and also told to get the blood test done to rule out diabetes. His A1c came surprisingly 9.1 he was immediately put on metformin considering normal renal functions but patient after couple of days reported nausea symptoms earlier it was thought nausea could be due to side effect of metformin and he was suggested to take some alternative medication sitagliptin but diabetes. 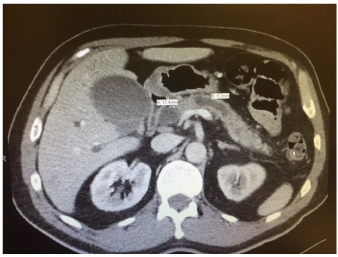 Patient called next day his eyes also yellow and he is vomiting he was sent to the emergency room and found to have severe obstructive jaundice, CT scan abdomen and pelvis showed pancreatic mass with metastasis. Patient not a candidate for any surgery palliative therapy started with poor prognosis. A CT abdomen/pelvis scan with contrast was performed, which is demonstrated in Figures 1 and 2. Common bile duct measures 17 mm as it courses through the pancreatic head. There is dilatation of the pancreatic duct throughout the length of the pancreas. Figure 1: Common bile duct measures 17 mm as it courses through the pancreatic head. There is dilatation of the pancreatic duct throughout the length of the pancreas. Pancreas Mass: Location: Pancreatic head and neck; Size: 41 x 39 x 31 mm; Enhancement: Heterogeneous; Pancreatic Duct: Dilated to 9 mm. Figure 2: Pancreas Mass: Location: Pancreatic head and neck; Size: 41 x 39 x 31 mm; Enhancement: Heterogeneous; Pancreatic Duct: Dilated to 9 mm. Leg cramps are common and frequently unreported to clinicians In the general population, they are present in 40 percent of those over the age of 50, have an increased frequency with age, show no gender preference, and are associated with sleep disturbance and overall poor health. But could be related to diabetes and that diabetes could be from underlying pancreatic cancer. The early symptoms of pancreatic cancer, such as abdominal pain, weight loss, fatigue, jaundice, and nausea, are nonspecific and may occur late in the course of the disease [1,2]. As a result, pancreatic cancer is usually diagnosed at an advanced stage, frequently after the tumor has already metastasized. Pancreatic cancer is insensitive to pharmacological and radiological intervention and often recurs after apparently curative surgery. All these factors contribute to the dismal prognosis of the disease. A recent onset of atypical diabetes mellitus [3-5] may be noted. Several studies have addressed whether earlier detection of nonspecific signs of an evolving pancreatic neoplasm (particularly in adults with new-onset diabetes mellitus) might improve respectability and overall outcomes, but the results are inconclusive. Numerous epidemiologic studies describe an association between diabetes mellitus and pancreatic cancer [6-13]. In a meta-analysis of 88 studies (50 cohort and 30 casecontrol, predominantly of patients with type 2 diabetes) the pooled relative risk (RR) for pancreatic cancer in diabetics compared with patients without diabetes was 2.08 (95% CI 1.87-2.32) . It has been suggested that diabetes may be a consequence rather than a cause of pancreatic cancer [14-16]. As an example, one study compared 512 patients with newly diagnosed pancreatic cancer to 933 controls of similar age . Compared with controls, diabetes was more prevalent in pancreatic cancer cases (47 versus 7 percent) and more likely to have been diagnosed in the preceding two years (74 versus 53 percent). After pancreaticoduodenectomy, diabetes resolved in 17 of 30 patients (57 percent) with newonset diabetes, while its prevalence was unchanged in the 11 patients who had longstanding diabetes. One intriguing possibility derived from in vitro work is that pancreatic cancers might induce paraneoplastic beta cell dysfunction and inhibition of insulin secretion by shedding exosomes containing adrenomedullin (a vasodilator peptide hormone that regulates insulin balance and may participate in the development of diabetes ) into the systemic circulation . On the other hand, other data support the view that abnormal glucose metabolism and insulin resistance are etiologic factors rather than the result of a subclinical cancer [19-23]. An association between pre-diagnosis serum levels of glucose, insulin, insulin resistance, and pancreatic cancer risk was suggested in a case-cohort study within the Alpha- Tocopherol, Beta-Carotene Cancer Prevention study, a primary prevention trial enrolling 29,133 male Finnish smokers aged 50 to 69 . Fasting serum concentrations of glucose and insulin, and levels of insulin resistance were assessed. The interval between serum collection and followup was up to 16.7 years. The study included 169 incident cases of pancreatic cancer that were diagnosed after the fifth year of follow-up and 400 randomly selected controls. After adjustment for age, years of smoking, and BMI, higher pre-diagnosis serum concentrations of glucose and insulin, as well as insulin resistance were significantly correlated with the risk of pancreatic cancer. The positive associations were stronger among the cases that occurred more than 10 years after baseline (highest versus lowest quartile for glucose, HR 2.16, 95% CI 1.05-4.42; for insulin, HR 2.90, 95% CI 1.22-6.92; for insulin resistance, HR 2.71, 95% CI 1.19-6.18). The prospective study design, with a minimum five-year follow-up prior to the detection of incident pancreatic cancer, minimizes the possibility that the identified insulin and glucose abnormalities resulted from “subclinical” pancreatic cancer. The mechanism underlying this association is unclear. However, at least some data suggest that the increased risk of pancreatic cancer in patients with metabolic diseases such as diabetes mellitus and other states of insulin resistance as well as obesity may be mediated by reduced levels of plasma adiponectin, a fat-derived hormone that has insulinsensitizing and anti-inflammatory properties . The data linking high glucose levels with an elevated risk of pancreatic cancer have led some to suggest that the new onset of diabetes in a thin older adult should prompt consideration of screening for early diagnosis of a potentially resectable pancreatic cancer. At least three studies have addressed the utility of CT screening for early detection of pancreatic cancer in adults with new-onset diabetes. Two uncovered mainly unresectable tumors, but they selected patients for screening based upon the presence of cancer-related symptoms. A third series from the Mayo Clinic suggested that CT scans done at the time of newly diagnosed diabetes in otherwise asymptomatic patients were more likely to show potentially resectable tumors than scans performed six months later . Whether higher resectability rates translated into higher cure rates was not addressed. CT screening of all older subjects with new onset diabetes in order to discover a small number of pancreatic cancers is not feasible. 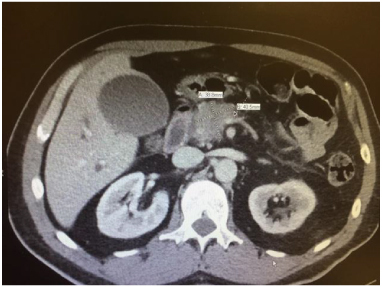 Identification of those features that differentiate pancreatic cancer-associated diabetes from other cases with new-onset diabetes would help direct efforts to the subset of individuals who would most benefit from screening CT, but these factors have not yet been established. Thus, screening CT scans are not warranted in older otherwise asymptomatic adults with new-onset atypical diabetes. At present, screening is only carried out for high-risk individuals who have familial syndromes predisposing them to pancreatic cancer.